Celeste and I took a quick trip out to one of our local Home Depots today to grab a tree. Unlike last year when it was sunny and 72 when we bought our tree, today's weather was a bit more seasonal - low 60s and drizzle. 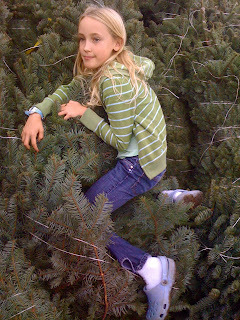 That didn't keep my grrrl from giving some firs a big hug. I just want to state that this is not the right way to get a tree. The "right way" entails driving out to the country to a small farm, bow saw in hand to cut your own after trudging through ankle-deep snow. Afterwards hot cider/chocolate is consumed in either an old school house or barn. But alas, that's not really an option for us here in Carlsbad. Regardless, it's a beautiful tree, all set up in the living room and giving off a nice, strong pine scent as well as providing a good dose of coziness.